BubbleFrame is one of the most fun apps for creating a quick collage on iPhone. In the app, you work with a square canvas, add a color, a pattern provided by BubbleFrame, or a photo from your own collection. BubbleFrame even changes some of their patterns according to the season, so you're not always limited to the patterns that you see. You can then add circular frames with an image and text inside over top of the background to create a unique collage. Recently, Marmalade Moon used BubbleFrame for a weekend Christmas Card workshop and it was a big hit! The developer, Devin, is very kind and willing to answer any questions sent his way. He even provided us with a few free codes to gift to some of the participants of our workshop. To learn more about using BubbleFrame, flip through the tutorial below, hovering over each image for detailed instructions. Tap the BubbleFrame app to open. Tap to start a new canvas. 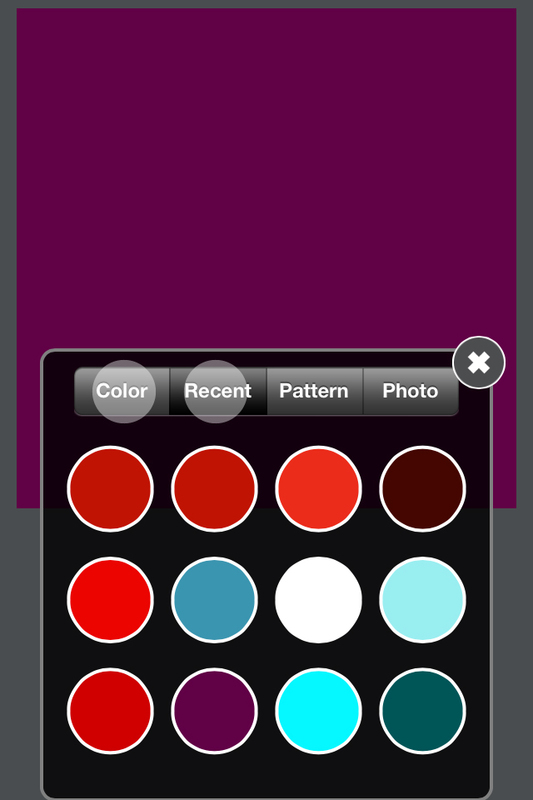 Tap "Fill Canvas" to choose a color, BubbleFrame provided pattern, or photo from your camera roll/photo stream. Tap "Color" to select a color from the color sliders or "Recent" to select a color that you've used previously. Tap "Pattern" to select a BubbleFrame provided pattern. BubbleFrame updates these from time to time, depending upon the season. Tap "Photo" to paste a photo from another app or to select one from your camera roll/photo stream. When you choose to use a photo that you've taken yourself, you have the option of using one from your camera roll or your photo stream. After you've chosen a photo, you can pinch the photo to zoom in further. Be careful not to zoom in very much though, as you'll lose some of the quality of your photo. When you're satisfied, tap the "adjust" button at the top to lock it in place. To add a new bubble frame, simply pinch with two fingers in an outward motion and a white outline will appear. After you've added your frame, you have the option of adding a fill, just as you did with the background. You may choose a color, BubbleFrame provided pattern, or a photo from your own library. Once in a while, you may accidentally add a BubbleFrame. You can delete it when the fill screen appears by tapping "Pop Bubble" at the bottom or you've exited from the fill screen, you can hold your finger on the frame until it wiggles and POPS! To edit the border, tap the "Border" button at the bottom of the screen. Style: You can adjust the border width, as well as the inner & outer gradient and shine. Simply tap the dot and drag to adjust each level until you have the desired effect. Color: Additionally, you can change the color the frame by tapping "Color" or "Recent". You can add text to your bubble by selecting the text button at the bottom (T). Type in the text you would like to wrap around the perimeter of the circle. Once you have typed your text, you can change the rotation, offset, and kerning by tapping "position" at the bottom. Then, you can tap the circles and move them back and forth on the sliders until you reach your desired text placement and position. Tap the "Font" button to adjust the font type and size. Text Color: Tap the box next to "Text" to change the color of the text. Additionally, you can add an outline to the text by tapping the box next to "Outline". Adjust the outline thickness by adjusting the "Outline Width" slider. Opacity: If you would like your text to be transparent, adjust the "Opacity" slider. To save or share your project, tap the camera button below. Saving/Export Options: You have the option to save, copy, e-mail, and export your project to another app. Sharing: Also, you can share it to Facebook, Twitter, and Instagram. Size: Adjust the size of your project by adjusting the slider at the bottom from normal to Hi-Res. We hope that you enjoyed this tutorial. You can use BubbleFrame graphics for many different projects, such as, blog graphics, avatars, and even greeting cards. To stay informed of the latest Marmalade Moon classes, including the possibility of a 2013 Christmas Card Workshop, sign-up to be a Marmalade Moon Club member! What do you think you would use BubbleFrame for? Post your comments below! Here's a roundup of all our Free Tutorials, Guides and App Tips for Mobile Photography and Art. iPhone collage: Vintage Happy Holidays Card by designer Jennifer Bishop. Isn't it curious how vintage meets modern in the latest cutting-edge technology? Like using Instagram filters to emulate the look and feel of the old-school cameras Polaroid, Holga, Diana, Yashica and Lomo, while using a touchscreen device? We're getting ready for this weekend's Online Christmas Card Workshop, and designer Jennifer Bishop (who is helping me with the workshop) created these two exquisite designs, one vintage and one modern and crisp, as samples for what you can do in the workshop. Will you join us for a creative weekend? 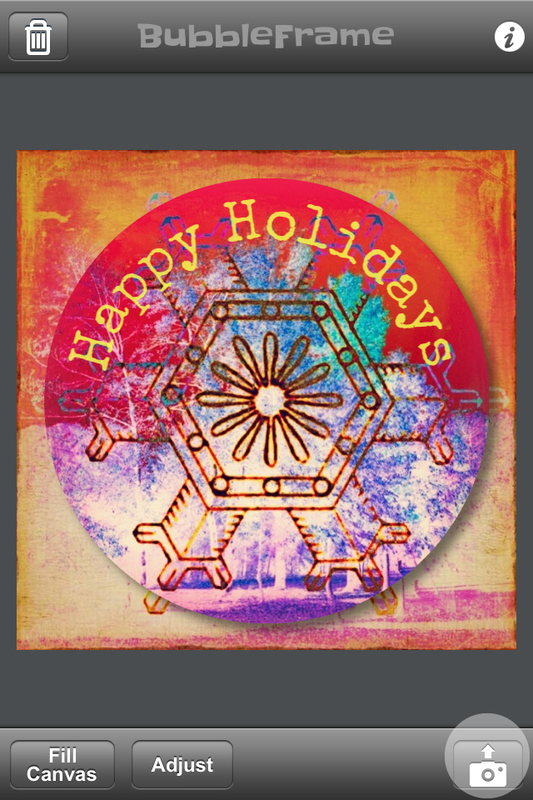 iPhone collage: Modern, graphic Happy Holidays Card by designer Jennifer Bishop.